Puppets Pizzazz will be performing at the library to kick off SummerQuest! There will also be food and door prizes. Rock the Library with Silly Joe! Bring the whole family and kick off our 2018 SummerQuest program with us. Check out all the exciting activities we have planned for summer fun. See ocean animals up close as the Center for Aquatic Sciences at Adventure Aquarium teaches us about animal calls. Open to all ages. Held in the Winsor Room. No registration required. Sponsored by Delaware County Libraries. Get a coupon for a free kids' water ice at Mainline Capri Water Ice for attending! Enjoy interactive, toe-tappin’, hand-clappin’ fun with your little ones as you sing new and classic rhymes and songs together. All ages welcome. Join us for our SummerQuest Kickoff party featuring the Sciencetellers "Wild West" show! The show will be held at Ridley Park Borough Hall. Join us for our "Libraries Rock!" themed Summer Reading Kickoff! The kickoff will take place in front of the library and behind our building at the beautiful Memorial Park. This an opportunity for children and teens to sign up for summer reading, participate in games, do a cool art activity, enjoy live music, and eat some tasty treats! Help us kick off the summer in an exciting celebration with Alex and the Kaleidoscope Band. Join Alex and his friends for an outstanding night of adventure through music, dancing, and singing. Recommended for Ages 5 and up. No registration required! Makin' Music will be at the library to kick off SummerQuest! 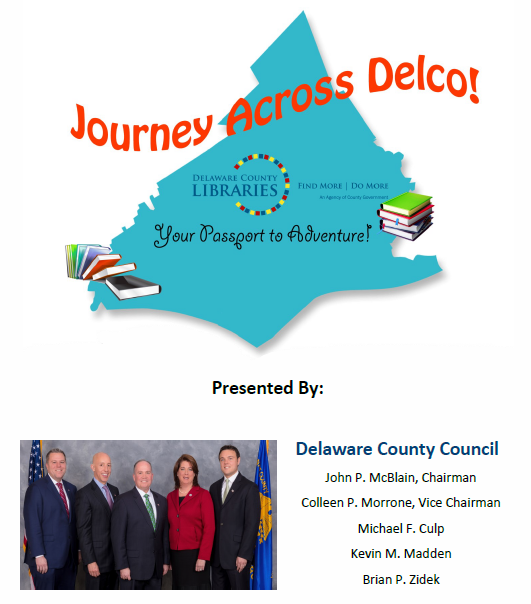 Pick up your Journey Across Delco booklet beginning June 16, and visit libraries in Delaware County during the summer. Return your booklet to your home library by July 27, and if you visited at least 5 libraries, you will be invited to an end of summer party at Rose Tree Park on August 7 from 1:00pm to 3:00pm. All kids going into Grades 2-8 are welcome to join our Pen Pal Program! You will get a Pen Pal who lives in another town in Delaware County. 1. Head to your public library and fill out a Pen Pal form before June 25th. 2. On or after July 1st, visit your library to get information about your Pen Pal. 3. Throughout the summer visit your library to drop off letters for your Pen Pal and pick up letters from your Pen Pal. You can send as many letters as you want! Pen Pals are invited to an end of summer party at Rose Tree Park on August 7 from 1:00pm to 3:00pm.